OC pepper causes eyes to slam shut and uncontrollable coughing and choking plus an intense painful burning sensation. CN Tear gas causes profuse tearing and disorientation. #80185 - Leather plus fits easily in pocket or purse. #80141 - Pocket easy aim finger grip feature makes this model ideal for emergency use. Features flip top safety cap, finger grip dispenser and keychain. #80112 - Police same model used by law enforcement personnel. Ideal for auto or home use. Velcro attachment included. 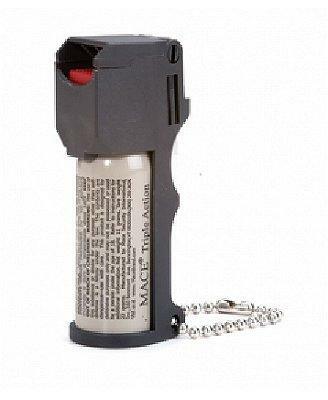 Features flip top safety cap, finger grip dispenser, belt clip and keychain.